Wrightslaw Christmas Sale! 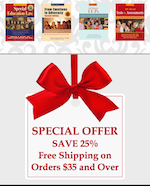 – Save 25% – FREE Shipping on Orders $35 and Over. Sale includes all Books, E-Books, Training Downloads, Advocacy Supplies and DVD. Use Coupon Code 20151225 when placing your order! Order Today! Offer valid through Thursday, December 10, 2015. Tell a friend. Interested in larger amounts? Everyday get a 40% to 50% discount for Bulk Orders (20 or more per title). Call 1-877-529-4332 for a quote. Thank you for using Wrightslaw materials! Merry Christmas! This entry was posted in General Info by Wrightslaw. Bookmark the permalink.